It has shops, bars and cafés, and restaurants. It is very convenient for El Rincon and Alameda del Mar. I last visited at the start of February 2011. If you notice something out-of-date, why not let me know? I will have to try them all out sometime soon. I have tried some already. I have to apologise here and say that I have found out the section over the road from Citrus is called Horizonte commercial centre. The businesses here have clubbed together, revamped the garden, and created a plaza - an outdoor space for tables and live music. Johnstone's Internet café -*extended - is attached to the supermarket round the back! Wok Asia buffet – Chinese. I think this is the sort where you pick up your raw food and they cook it individually while you watch. Racin´Toast - place your bets and eat breakfast or evening snacks. *new Sarung Banggi - Fillipino / German café bar - small and cosy, on the Horizonte Plaza inside terrace / patio, behind the hairdresser Heidi. Coming soon - Italian Pizzeria. There is also a Telefonica telephone booth outside the Todo Loco bar. Pretty convenient – get your friends to buy you a drink while you phone home. 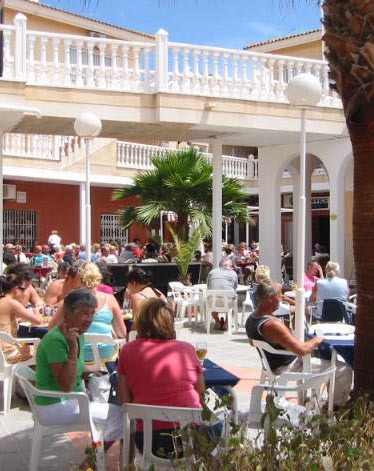 Very easy – go round to the back of El Rincon and exit by the new gate. Turn left and then take the next right into Calle Clementina. You can see the big yellow Wok Asia sign. Two minutes to the crossroads. See my detailed map for help.